Going back to the list didn’t help any. 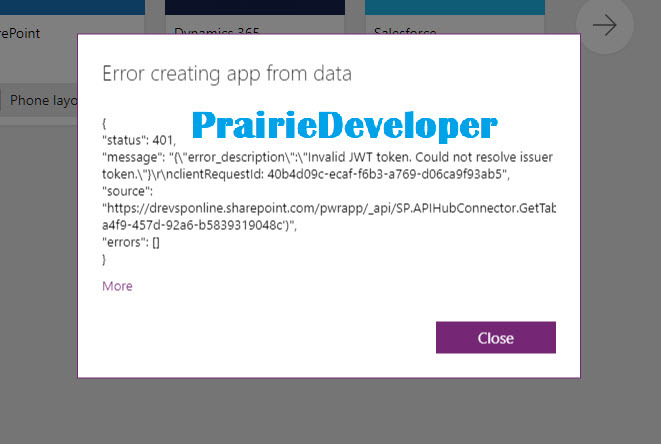 Even though I didn’t have a PowerApp created, the list thought it existed. Clicking “Remove this view” removes the PowerApp view from the list and doesn’t harm the metadata. I thought at first I had a badly configured field, but nothing seemed out of place. All of the fields were populating data as expected and the data saved successfully with the list forms. Reviewing the error a bit closer it looked a lot like an access issue. Problem is this is my tenant and currently I have only 3 accounts. The one I was using was the global admin, so it shouldn’t have been that. I then took a look at my PowerApps Admin console and noticed an exclamation point on the Connections menu. Clicking on it, the newly created connection indicated the password needed to be updated. Clicking on the “Update Password” option opens a dialog to the Microsoft portal. I was then able to update my portal. Next time I attempted to create my app it worked like a charm. I’ll talk about that next week. Hope this helps someone with a similar issue.